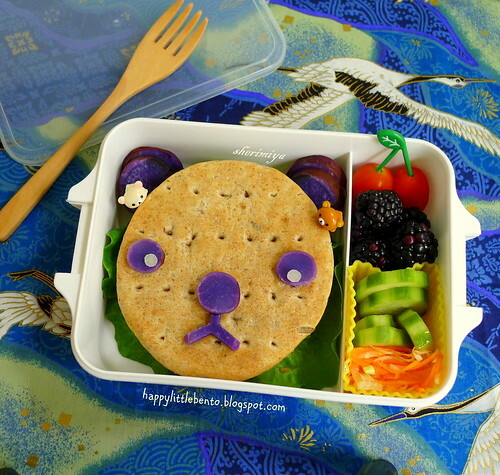 Bearwich Bento, a photo by sherimiya ♥ on Flickr. It's Monday and MisterMan is back from his camping trip to Gold Country! He had a fantastic time, as I expected, and he learned a lot. The kids panned for gold, baked their own cornbread in the coals, and negotiated their own solo hike (part of a 3 mile, 800 ft elevation gain trek!). I was surprised that 4th-graders were able to handle themselves responsibly and effectively (within small parentally chaperoned groups), with limited to no adult help. So proud of my young man. 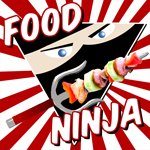 We spent the weekend together enjoying our reunited family, and that means the Monday bento is a quickie sandwich one. This one is a salmon burger with lettuce on a whole wheat sandwich thin, with strategically positioned steamed Okinawan sweet potatoes to depict a bear face. That's all I could manage today, along with tomatoes, blackberries and house-pickled cucumbers and carrot-daikon sticks. Hope you all had a great weekend and are ready to tackle a new week ahead! I want to go pan for gold!! Lol! I haven't done that since I was a kid, but I remember it being so much fun. :) What a cool adventure for MM! I remember panning for gold when I was a kid, and we got big flakes and maybe even actual "nuggets" - these days you need a microscope to see their haul. But they got to see the "real" mill and hear all the Native American lore. Very cool.